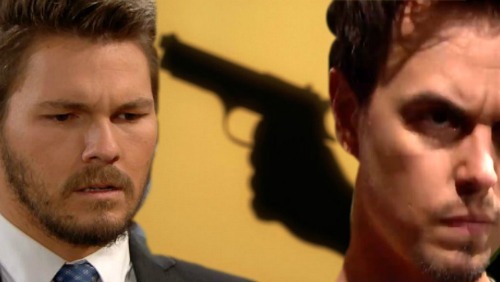 The Bold and the Beautiful (B&B) spoilers reveal that Liam (Scott Clifton) has a wild ride ahead of him. B&B has offered some huge hints about Liam’s guilt, but confirmation is looming according to SOD. Once Liam truly accepts that he’s the shooter, he’ll face a difficult task. Liam will undoubtedly confess to Bill (Don Diamont), who may or may not turn his son in for the crime. Bill could easily let Liam go down as a way of seeking revenge. However, it’s possible Bill will give Liam a pass for his actions. After all, Bill proposed to Steffy (Jacqueline MacInnes Wood) and drove Liam to fire that shot. If Bill hadn’t popped the question that night, he wouldn’t have received a bullet in the back. Going back even further, Bill and Steffy’s betrayal set all of this in motion. They had no idea what was in store when they hooked up that night. Nevertheless, what’s done is done and now there may be consequences. Even if Bill clears Ridge and refuses to hand Liam over to the cops, Detective Sanchez (Jeremy Ray Valdez) will keep digging. He’s determined to solve the puzzle and put the right person behind bars. There’s a good chance that Liam will be arrested sooner or later. Meanwhile, we know Steffy will likely give birth during May sweeps. Since she hasn’t had a major medical crisis yet, that has to be coming. Soaps don’t let pregnant women give birth without one! Will Steffy freak when Liam’s taken into custody? Will she panic over the possibility of Liam landing behind bars for many years? Those seem like safe bets. Depending on how the timing works out, Liam’s ordeal could be what sends Steffy into early labor. This is bound to be an incredibly stressful situation. The Bold and the Beautiful spoilers say Steffy will battle some guilt of her own. She’ll feel like it’s her fault that Liam’s in such a mess and that’s pretty much true. Bill played a role in this as well, but you could argue that Steffy’s the main problem. She’s the one who had marriage vows to honor. It sounds like Steffy will face a rough delivery down the road. We’ll give you updates as other Bold and the Beautiful news comes in. Stay tuned to B&B and don’t forget to check CDL often for the latest Bold and the Beautiful spoilers, updates and news.